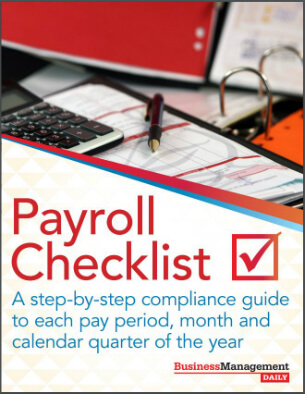 Claim your FREE copy of Payroll Checklist: A step-by-step compliance guide to each pay period, month and calendar quarter of the year! Year-end for Payroll and Accounts Payable doesn’t just begin in the third quarter, ramp up in the fourth quarter and wind down at the end of the first quarter of the next year. It’s often said that the ultimate goal is an uneventful year-end. One key way of achieving that goal is to understand that year-end is, really, a year-long process. Best advice: You can never overcheck for accuracy. Here’s a checklist you can use to help guide you through each pay period, month and calendar quarter. Since year-end is a long and arduous process, you should jot down your year-end procedures as you complete them, and add them to this checklist. That will make your next year-end a snap. Review vendor contracts for vendors’ Taxpayer Identification Numbers (TINs). Begin backup withholding for vendors who didn’t provide their TINs prior to payment. Solicit TINs by sending them Form W-9. Track amounts paid to independent contractors; Form 1099-MISC reporting is necessary for vendors who receive cash payments of $600 or more during the calendar year. Track vendors who accept credit card, debit card or other electronic payments; Form 1099-MISC reporting isn’t required for those vendors. List each earning and deduction category and tie those figures to Form 941, Line 2. Map and reconcile each payroll earning and deduction category to the general ledger. Post employees’ benefit/payroll adjustment data. Include: third-party paid sick pay and manual and void checks. Run payroll adjustments for year-to-date corrections. Get input from other department (e.g., Accounts Payable, Finance, HR and Benefits) to track taxable payments to employees that aren’t made through the Payroll department. Tax and post adjustments, as necessary. Break out taxable executive benefits and get input from the appropriate departments (e.g., Executive Compensation Committee) to track taxable payments to executives. Tax and post adjustments, as necessary. Reconcile your tax register and bank accounts. Research outstanding checks that are older than 30 days; post unclaimed checks to an unclaimed earnings escrow account. Document gross-to-net calculations for manual checks; ensure that manual checks and voids are entered properly; review the general ledger accounts. For income tax withholding, create a worksheet to reconcile taxable wages, from Form 941, Line 2 to taxable wages, as recorded in a wage summary report; also, reconcile the tax amount, from Form 941, Line 3 to taxable wages, as recorded in a wage summary report. Create a worksheet to reconcile your state tax liability to state taxable wages, as shown in a wage summary report; also, reconcile state taxes withheld to state taxes deposited. Tie federal income tax withholding totals to state income tax withholding totals. For Social Security tax withholding, create a worksheet to reconcile taxable wages, from Form 941, Line 5a to taxable wages, as recorded in a wage summary report; also, reconcile the tax amount, from Form 941, Line 5a to the taxable amount, as recorded in a wage summary report. For Medicare tax withholding, create a worksheet to reconcile taxable wages, from Form 941, Lines 5c and 5d to taxable wages, as recorded in a wage summary report; also, reconcile the tax amount, from Form 941, Lines 5c and 5d to the taxable amount, as recorded in a wage summary report. Create a worksheet to reconcile FUTA tax liability to FUTA taxable wages, as recorded in a wage summary report; also, reconcile FUTA tax amounts to FUTA tax calculations. Create a worksheet to reconcile SUTA tax liability to SUTA taxable wages, as recorded in a wage summary report; also, reconcile SUTA tax liability to SUTA tax amounts. Tie FUTA totals to SUTA totals. Create a worksheet that reconciles the Form 941 totals and wage summary totals to Forms W-2/W-3. Balance quarterly reports and Forms 941 to the general ledger. After filing Form 941 for the quarter, make interest-free adjustments of underreporting errors by filing Form 941-X by the due date of Form 941 for the quarter during which the error is discovered, and pay any tax due. Also, file Forms W-2c/W-3c, as appropriate. Notify the mailroom of the date your Forms W-2 will be mailed. Remind mailroom personnel to have sufficient postage in the postage machine. Send memos to employees explaining that Form W-2 Box 1, 3 and 5 entries may differ due to pretax deductions. Prior to processing your Forms W-2 and fourth-quarter Form 941, verify that the general ledger accounts balance. What to look for: employer/employee tax withholding accounts. Be prepared to make correcting journal entries for out-of-balance situations caused by year-end adjustments. Check that employees’ requests for duplicate or corrected Forms W-2 are signed by employees and that signatures are legitimate. This ensures that ex-spouses haven’t slipped one by employees. For corrected Forms W-2 issued to employees prior to filing, check the Void Box on Copy A, and insert “Corrected” at the top of Copies B, C and 2. By February 10 (or the next business day, if February 10 is a nonbusiness day), file Form 941 for the fourth quarter. This due date applies only if you deposited the taxes for the quarter in full and on time. File Forms 940 and 945. This due date applies only if you deposited the taxes for the year in full and on time. When logging onto the SSA’s business services online, check your user ID characters. For example, a capital “O” could be mistaken for a zero, or a lowercase “l” could be mistaken for a one. Try the other choice if your first choice doesn’t work. Send Forms W-2c to the SSA as soon as Form W-2 errors are discovered. Reply promptly to any SSA notice that Form W-2 totals for a year disagree with the IRS’ Form 941 totals. By April 30 (or the next business day, if April 30 is a nonbusiness day), file Form 941 for the first quarter with the IRS. By May 10 (or the next business day, if May 10 is a nonbusiness day), file Form 941 for the first quarter with the IRS. This due date applies only if you deposited the tax for the quarter in full and on time. Ensure that all monthly, quarterly and annual balances are accumulating properly; pay attention to adjustments. Inquire whether your group health insurer will pay medical loss ratio rebates this year; tax, withhold, and report rebates that are attributable to employees’ pretax contributions made during the previous calendar year. Visit the SSA’s website www.ssa.gov and download and review changes to the Form W-2 e-filing specifications—Electronic Filing of W-2s (EFW2). First-time e-filers can take an SSA-provided tutorial; all e-filers can use the SSA’s Accuwage program to test files for errors. By August 10 (or the next business day, if August 10 is a nonbusiness day), file Form 941 for the second quarter with the IRS. This due date applies only if you deposited the tax for the quarter in full and on time. Alert Finance as employees max out on the Social Security taxable wage base and state unemployment/disability wage bases. Review year-to-date salary figures for high earners. Begin withholding Medicare taxes at the 2.35% rate for employees when their wages exceed $200,000. Plan holiday pay schedules by reminding managers of the deadlines for submitting time sheets. Send current year Forms W-4 to employees. Use these forms to fulfill your solicitation duties, if you receive a notice from the IRS that an employee’s name/Social Security Number doesn’t match. Ensure that employees’ 0.9% additional Medicare tax is accumulating properly; ascertain whether any interest-free adjustments need to be made, and begin the process now. Set up a year-end committee, assign tasks and completion dates. Include: Accounting, Finance, HR, Benefits, Mailroom and IT. Create an online log so everyone can see the progress of all participants. Confirm employees’ addresses and update your computer-generated mailing labels, as necessary. Ask employees to confirm their Social Security numbers; if your payroll system masks Social Security numbers, unmask them so employees can confirm them. Mark November 1, or any later date, as the cut-off date, if you use the special accounting rule for noncash fringe benefits. By November 10 (or the next business day, if November 10 is a nonbusiness day), file Form 941 for the third quarter with the IRS. This due date applies only if you deposited the tax for the quarter in full and on time. Once your third-quarter Form 941 is filed, check your records against the totals on all three forms. Identify any over-or under-reporting of income or wages, and adjust tax overpayments or underpayments on your fourth-quarter Form 941. Notify employees if you’re not withholding on their personal use of company cars or are using the special accounting rule to value noncash fringe benefits. Double check employees’ pretax deductions, coding for Form W-2, Box 12 and year-to-date figures.